Submitted by dennis on Tuesday, April 12, 2016 - 9:15am. 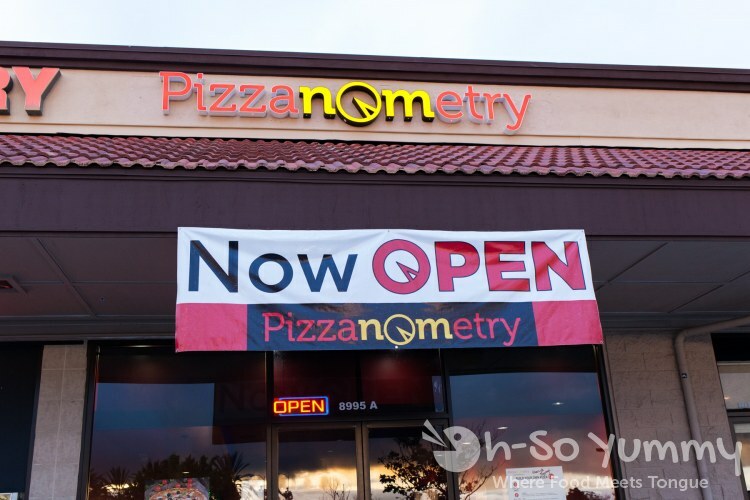 Pizzanometry is the new build your own pizza place in town that recently opened a few weeks ago. 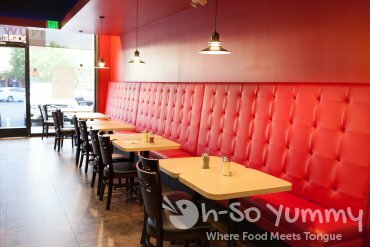 It replaced D&C Tofu House and is located next to Siam Nara and Pho Ban Mai in the Rite Aid shopping plaza. 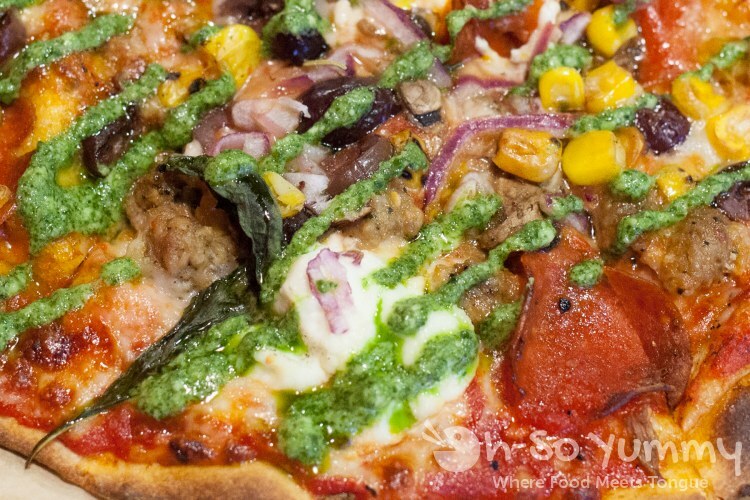 For those of you who are not familiar with this concept, you get to create your own pizza masterpiece from start to finish using a large variety of ingredients. 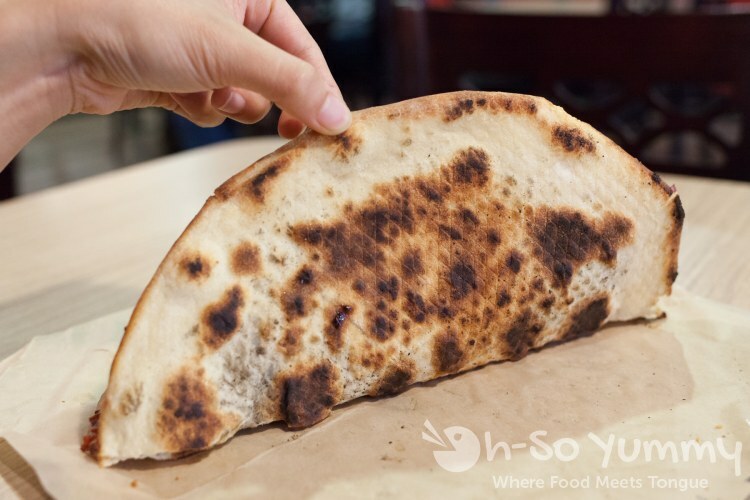 You start with the type of dough, followed by the sauces and cheeses, and then finally the meats and the veggies. But wait, what is the difference between this and a traditional pizza restaurant you ask? 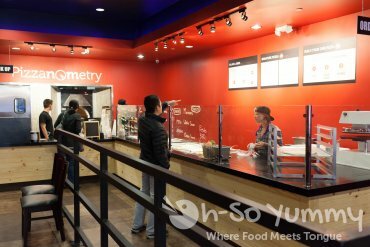 Well here, there is more interaction between the customer and your pizza stylist (that's what I call them). 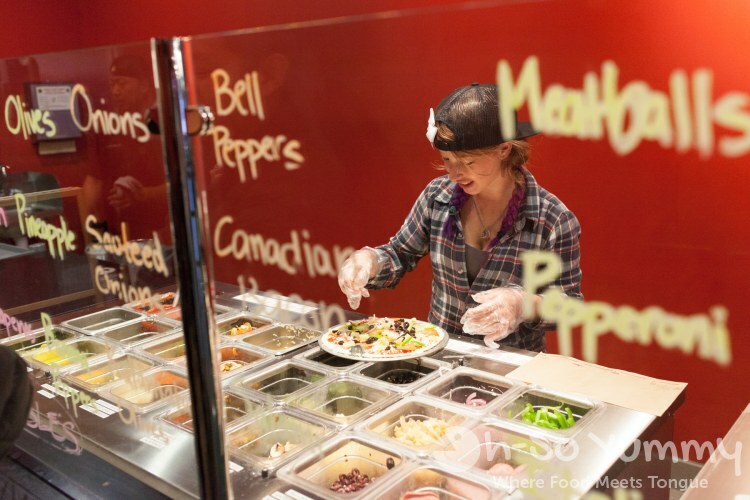 You also get unlimited toppings all for the same price of $7.99! Of course, you can always opt for the classic predesigned pizza combinations if you don't want to go through the pizza gauntlet. We came in after the dinner crowd so we were fortunate for a short wait in line. 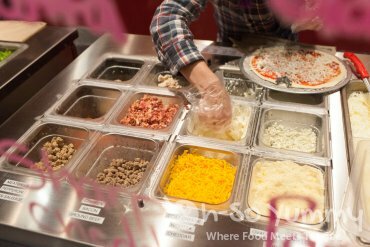 With all of the topics that were available, and many people coming out due to the rain, we had all the time in the world to carefully select our toppings. 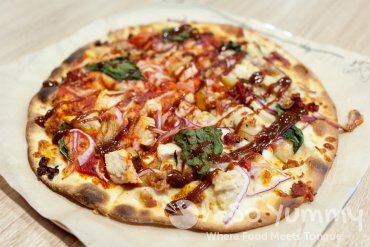 Lynn started with a BBQ Chicken Pizza as a template and then added a few additional toppings to it. I went with a custom design and ended up with one monster of a pizza. On the right is one of the business partners, Ron, handling some of the baking and timing. The other business partner is the original owner of the prior D&C Tofu restaurant. There was a slight confusion where I asked for the pizza well done and Lynn's ended up cooking the same amount. Lynn decided to get half her pizza with tomato sauce and the other half without as a means of testing out the flavor of the dough. 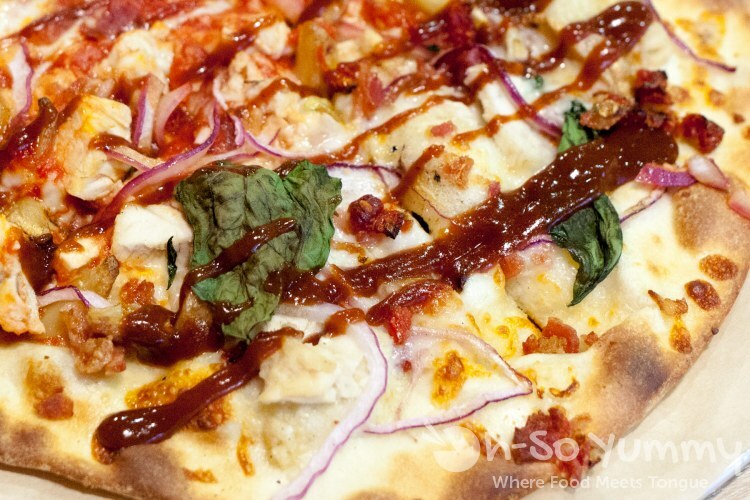 Otherwise the toppings are the same on both sides which include mozzarella, chicken, bacon, red onion, roasted garlic, fresh basil, and bbq sauce. The crust was thin and a little more brown and crispy than she preferred due to the "well done" cooking. Also the barbecue sauce was somewhat sour which didn't fit the pizza flavor as built. The rest of the ingredients combined nicely, especially the softened roasted garlic bites! My pizza was made up of tomato sauce, mozzarella, ricotta, italian sausages, pepperoni, red onion, mushrooms, roasted corn, kalamata olives, fresh basil, and a pesto finisher dressing, which is made in house. After listing those ingredients out, it does sound like I went a little overboard with this one... I usually try to limit myself to around five toppings but I just couldn't help myself this time! These are usual go to selections, although, not usually all at the same time. It actually tasted pretty good and the well done crust held up quite well. This is what the bottom side of a pizza cooked well done looks like. I recommend well done if you go pretty heavy on the toppings. Otherwise if you keep it thin and simple, the dough may end up a bit more crispy than desired. Something unique about Pizzanometry is the "wire rack" bottom of the pizza pans. You can actually see the tiny little indentations due to the surface! 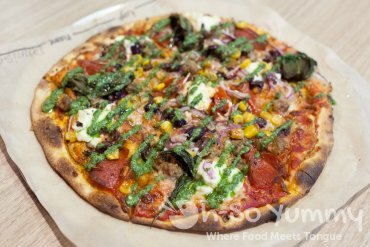 One other thing Lynn pointed out was how the bottom of the pizza was a lot cleaner than other places, namely PizzaRev. This is due to the use of oil instead of an abundance of cornmeal. Other places may not clean up the stove regularly enough which means you get burnt bits stuck to the bottom and your hands get black and dusty. Not here. 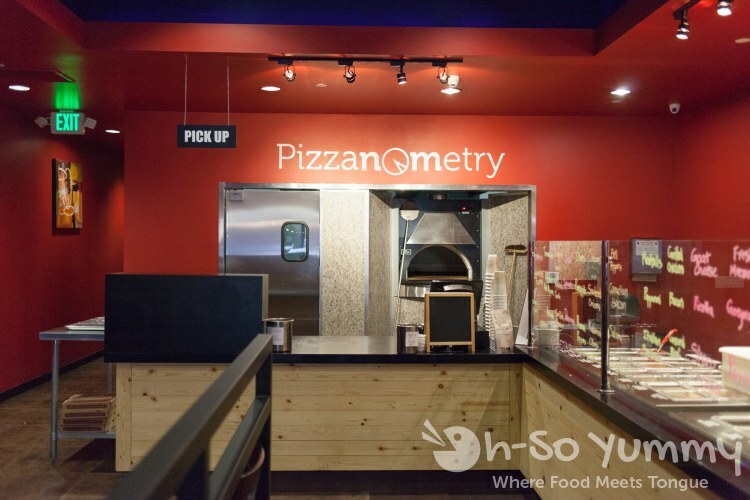 We're ecstatic that Mira Mesa has its own build your own style pizza shop. As novel as it sounds, there is just something very satisfying about the process and watching your creation from start to finish. The restaurant is also close to where we live and and where I work. 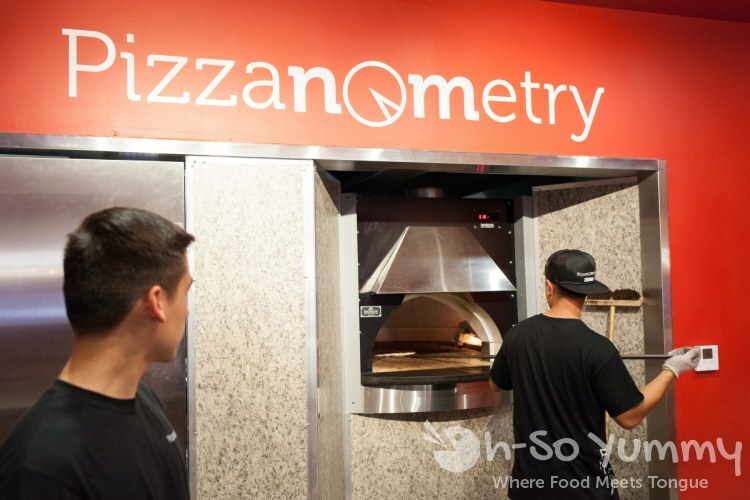 Pizzanometry is still currently in the soft opening phase while they make tweaks here and there to perfect their pizza craft. Also on the current menu is salads. 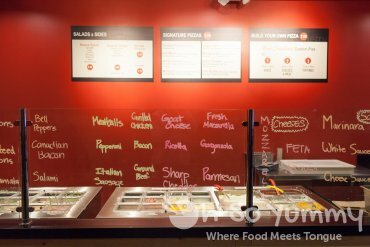 Ron says he is planning on multiple new offerings including specialty toppings and desserts in the coming weeks so we'll definitely be coming back to try them. With all these new restaurants like 85C, Crab Hut, and Luna Grill coming to town we're happy that we have more variety that is local. Score! 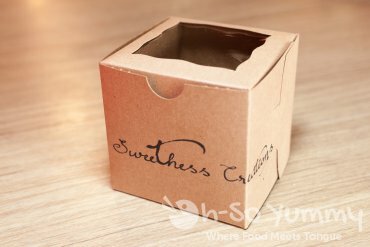 Here's a sneak peek of the new dessert offering... freshly made by Sweethess Creations (go like their page and check them out). 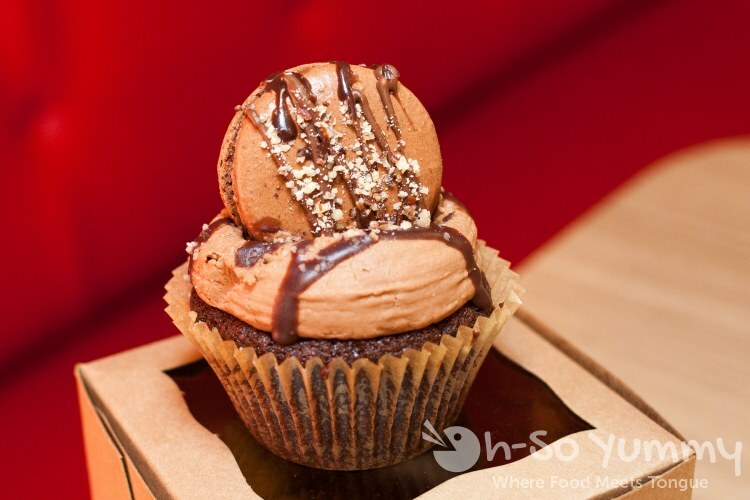 Imagine this... a ferrero rocher chocolate cupcake with a nutella center and a nutella macaron on top! 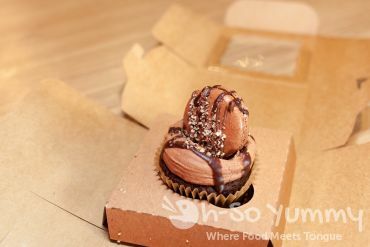 Moist yet cakey chocolate goodness with a nice chew in the macaron shell. A limited number will be available at $6 and the flavors may change up each week. I dig this new place! I like that you can really customize it and ask for it "well done" (which I have yet to try). My first visit was better than my second one - I put too many toppings on my second visit and the dough was a little soggy. Less is more when it comes to pizza! The pesto drizzle looks really good - I'll have to try that next time I go. yea i'd do the pesto again but not the bbq (unless they've changed it since my visit). it's so cool to have one in mira mesa. i get BYOP (build your own pizza) cravings quite often. This looks fantastic! I love seeing what's popping up in new neighborhoods - I'm always wondering where to go when I'm outside of my downtown area. mmm, roasted garlic. it sounds like something i need to make at home. slice off the tops and roast. a yummy garlic smell throughout the house haha.